One of the most frequently asked questions we get is how to use the "Prospect Finished" trigger for your workflows. Here's how to do it. Reason for finish - Bounced, Replied, Finished after X days, Manual. Finished step - Current step number in the campaign for the prospect that was finished. Number of steps - Number of all steps in the campaign at a time when the trigger was launched. This use case describes how to use the Prospect Finished trigger with Pipedrive. In your Pipedrive account, navigate to Settings - Customize fields. Select People and click Add a field. Enter the name of the custom field, for example Reason for finish. 5. 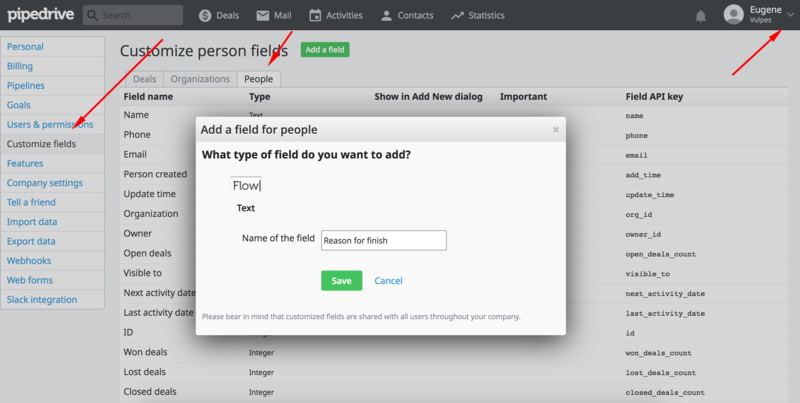 Open the Contacts tab and add the created fields. Log into your Zapier account and click MAKE A ZAP!. Select Reply as a trigger app. Select Prospect Finished as a trigger. 4. Connect your Reply account. 5. Select Pipedrive as an action app. 6. Select the Create or Update a Person action. 7. Connect your Pipedrive account. 8. Map the Reply fields to your custom Pipedrive fields, including your custom Reason for finish and Finished Step fields. Now you can see the Name, Email, Phone, Reason for finish and Finished step for your prospects when they get the Finished status in Reply campaigns.